Well in the aftermath of last week's press release criticising the presence of Richard Barnbrook, now apparently plotting the resurrection of the Far Right in the UK as an electoral force, at the Foundation Trust event for future LAS governors, and the total ignoring of equal ops issues by the LAS in terms of employment etc, I am attending the LAS NHS Trust Board meeting tomorrow, where I am certain to get a frosty reception. The issue of the Foundation Trust status is again on the agenda as are a number of other items including their response to the 7/7 Inquest and the recommendations to the LAS. The Chief Executive of the LAS sent a rather waffly response last week about the press release which I issued on behalf of the Patients Forum - it is below. 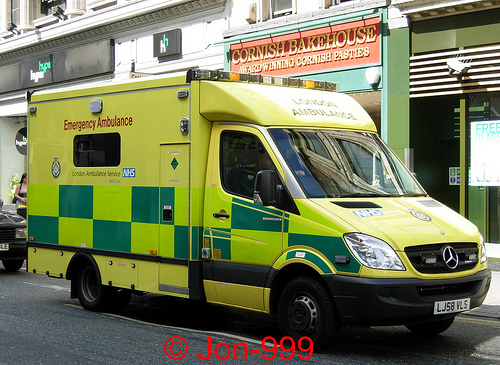 In the interim, I have heard some quite disturbing stories about ambulance crews and BME patients - more of that anon. Not looking forward to tomorrow's meeting where I am, as usual, likely to be the only member of the public present. I write in response to your email of 13 May regarding the event for prospective foundation trust governors last week. As you will be aware, the meeting was open to all members who had indicated an interest in standing as a governor. I made reference to a number of those who were attending – including ex-members of staff and Patients Forum members – and did so to Mr Barnbrook in his role as an elected member of the London Assembly and member of their Health and Social Services Committee, which is currently carrying out a review of the Service. Indeed, it was clear from correspondence with him before the event that he was attending in this capacity. Furthermore, I was unaware he was a member of the LAS until that evening. We have around 5,000 public members as you know, and I am not aware of each individual member’s details. Given the circumstances and public nature of the meeting, it was clearly not going to be possible to resolve your concerns at the time, and it was in this context that I and a number of other senior managers listened to and acknowledged the points you made. However, it is regrettable that you should have felt the need to suggest going to the media before giving us an opportunity to address the issues and correct factual inaccuracies, as this is not at all helpful to our relationship with the Forum. The process for electing members to the council of governors will be fully in line with the terms set out by Monitor. Anyone who stands for election will have to state whether they are a member of a political party in their nomination paper, and it will then be for the members of the constituency group that he or she is standing for to decide whether they wish to vote for them. While acknowledging and agreeing with your point that there needs to be equal opportunities around this process, it should be recognised that this in itself will enable anyone to put themselves forward for election, regardless of their political beliefs or affiliations. Moving to your statement regarding the diversity in our workforce, I can advise that currently nine per cent of our staff are recorded as being from a BME background. You will know that we would like this to be higher, but also that the Patients Forum has been involved throughout the development of the both the equality inclusion strategy and soon-to-be-published positive action strategy, and that you have representation on the equality and inclusion steering group itself. We are also continuing to develop staff diversity forums, to help further assist our work to support key equalities initiatives and increase under-representation of these groups within the Service. In terms of the Trust Board, in line with other NHS trusts we have had to recruit non-executive board members through the NHS Appointments Commission, which follows a clear and open process of recruitment. Executive positions are appointed using a similarly transparent process, which is in line with best practice and includes external input to the selection procedure. We have improved our representation on the Board in a number of areas through our recruitment, albeit not visibly within BME groups. I hope that this helps to clarify our position. This is an interesting response, and I look forward to seeing what you have in regards to the "disturbing stories." May I urge caution before you publish them. I believe it is dangerous to publish only one side of any events which have taken place. You will remember the Tomlinson incident. Until contradictory evidence arose there was only one side of the story available - that Mr Tomlinson had died of natural causes and that there was no prior contact with the police. The LAS investigates complaints against staff rigorously. I don't know whether the ethnicity of complainants is collected. I haven't seen any figures, but I will have a root around when I have an opportunity. If they are available, it would be interesting to see whether they support or refute your racism hypothesis. As I said in my post http://wp.me/p1uaw9-2B there are two questions which should be answered. "Our partnership approach ensures we work closely with individual organisations to identify their specific needs, which are then reflected in our recruitment strategies." So has the LAS specified that the non-executive directors should include BME, disabled, younger, or older members? If the answer is yes, then where are they? And if no, then why not?